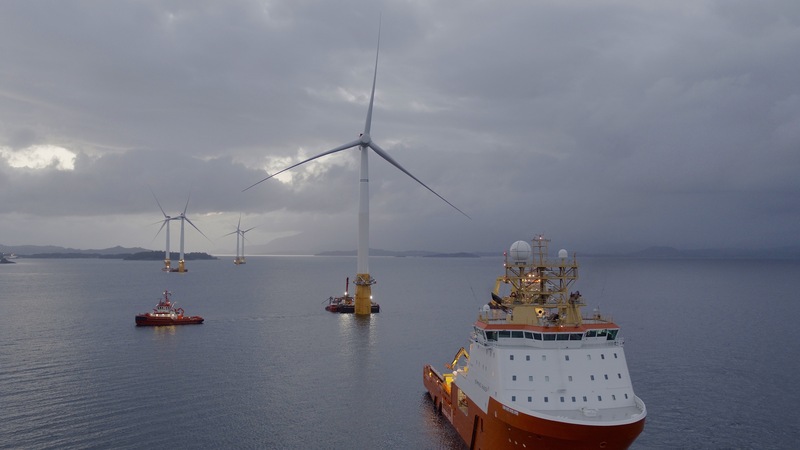 The world’s first floating windfarm, off the coast of Aberdeenshire, is now supplying power to thousands of homes. Equinor’s Hywind project celebrated its first production milestone in October 2017, with the resultant energy taken down an export cable into a sub-station at Peterhead. AREG has backed the project since the early concept was revealed. With wind turbines nearly twice the size of Big Ben and blades the same width as a passenger plane’s wing span, the project team has overcome many technical challenges to make the concept a reality. The £200 million project, co-financed by Abu Dhabi’s Masdar, has created 10 jobs in Peterhead, with staff in Aberdeen and Great Yarmouth providing support. Located at Buchan Deep, 25 km off Peterhead, Scotland. The pilot windfarm can power provide renewable energy to approximately 20,000 UK households. Turbine height: 253 meters in total. 78 meters below sea surface, 175 from sea surface to wingtip. Rotor diameter: 154 metres. Total weight near 12,000 tonnes.